As it is Sunday I think we will go posh again and have another coach trip this time courtesy of ‘Yelloway Motor Services’ of Rochdale Lancashire. Taken at the 1966 Blackpool Coach Rally this coach was entered number 18, unfortunately ‘Harrington’ body builders ceased trading that very same year, shame really this was a very classic look for the mid sixties. The same was also to happen to ‘Yelloway’ this a short extract from Peter Goulds excellent web site giving the history of Yelloway. Now it would appear that Carlton PSV couldn’t run a booze up in a brewery never mind a bus service, by 1988 what was once a great coach operator had gone. A bus company with a 73 year history wrecked in a little under three years, now that takes fantastic incompetence doesn’t it. If you want to read Peter Goulds full history of ‘Yelloway Motor Services’ and it is well worth doing so click here. Sheffield United Tours/National Travel East were bought and ruined by Carlton PSV as well. The Yelloway Motor Services name lived on, however. If you Google Yelloway Motor Services you will find they live on – in a new incarnation – in Oldham. A modern version of the traditional livery now adorns new Neoplans, Scanias and Volvos. The man in the dark coat on the left of the photograph is Jack Wilson, the Yelloway Traffic Manager. He sported a large moustache and had a certain air about him. As office boys we revered him. When he was dressing down a driver he often included the word ‘boy’ when addressing the man which was never well received. (For example ‘You will boy!). The driver of the coach, to whom Mr Wilson seems to be talking, was the regular Yelloway rally driver, Bill Grundy. He subsequently became an inspector based at the Yelloway Manchester terminals. I have many memories of Yelloway coaches. As a child I travelled between Grandma’s, one lived in Worcester the other in Oldham so I was put on the coach and travelled alone between the two. I recall arriving at Mumps Bridge Oldham to be met by one Grandma and being taken to Blackpool by her on the coach. I did spot some old coaches near Brixham Devon and wondered if it was a museum to them. Happy days!! The P reg Duple Dominant mobile museum lives somewhere in Devon. It is probably what you have seen. I have many fond memories of travelling with Yelloway from Leicester to Blackpool, From being a lad in the fifties until the services ended in the eighties, and it is wonderful to have these memories kept alive by the dedication of others, Thank you. I was a driver at Yelloway for three summer seasons, (1972 /3/4) I have some brilliant memories of my time there, I made friends for life, and we still get together today from time to time, and we always reminisce, Yelloways had that effect on us,and for your information, the P reg coach that you see down in Devon belongs to my friend Dave Haddock, and it is a travelling Yelloway museum, my licence and PSV badge are amongst the artifax along with other friends and colleagues of mine, you can view Daves brilliant website here it’s stacked with great and accurate info. It’s great to see the Yelloway name living on, long may it continue. I looked at the Yelloway website; very good and thanks for the link, Alex. I did laugh at the photo, on the home page, of the steam charabanc. The body crudely bolted(?) onto the flatbed rear. At that height, you’d come a real cropper if you fell out! Just imagine, 20mph max, all that smoke steam and smuts, slightly offset by the luxury of pneumatic tyres. It’s so crude, but I’d love to have a ride in it today!!! Anyone want to guess who “us” is. If it had been the 1950s or 1960s my guess would have been that "us" was either Hanson or Hebble. In the 70s I’m less certain – National Travel?? Mike 9 put “us” out of our misery! Going by the comment under the posting for Daimler Roadliner CVC 124C, I would suggest ‘us’ could be Black and White Motorways, of Cheltenham. 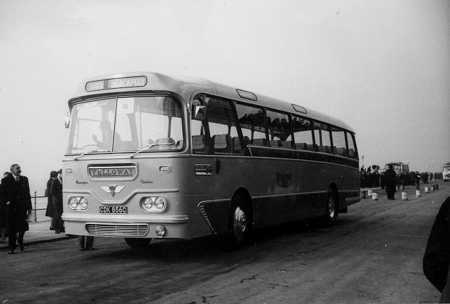 In another post Mike 9 tells us that "us" had Plaxton-bodied Daimler Roadliner coaches and then went back to Leopards. Black & White? In my spotting days at Cheltenham the garage was always cleared on a Friday night for Yelloway to use as their hub. During the day you would probably on see 6 or 7 actual Yelloway vehicles, but the area around the garage would be rammed with coaches on hire to Yelloway mostly Bedford Val 6 wheelers. Those on layover would be ordered out of the garage and sent to Clarence Square and adjoining roads to park up until ready to return for the 16.30 departures oh happy days. Does anyone know if the vehicle in the shot above was eventually bought by JayBee Coaches of Lees, Oldham ? (I used to drive one for him and this could be it). Who remembers the slogan ‘You are well away with Yelloway’ That was used on their TV advertising. There is an advert on YouTube it is only short but it is worth a look. There used to be another one on there but I can not find it. In the late 30s I was employed on building The Derbyshire Yeoman Pub at the junction of the A52 and the Derby ring road at Mackworth. Late morning I would try to position myself to watch a convoy of Yelloway coaches, all Burlingham AECs as they brake for the junction island. This lead me to book a trip to The commercial motor show and travelled over night to the Kings Cross bus station. after a happy tiring day I returned to Kings Cross bus station and boarded a brand new Duple bodied coach getting a front seat as a bonus. As we passed through Northampton we uncounted patches of fog. When we ran into one patch the driver braked hard as we came out of the gloom we were confronted with 2 men trying to bump start a Ford Zephyr. The look of horror on their faces is still clear in my memory. I’ve no recollection at all of the Yelloway advertisement above, but it is superbly designed and presented – it would certainly have persuaded me to look further if I hadn’t been aware of the facility. With regard to Howard’s question of some time ago, the Yelloway vehicle that worked for JayBee was 4640 DK. I’m doing some research on this operator for my Saddleworth Buses gallery and any additional information and any memories of driving for them would be very welcome indeed, as would photographs. Where were the vehicles garaged? JayBee had an interesting fleet as they had an ex-Bullock’s Seddon Mark 11, a Seddon Pennine 6, a Bedford VAL and a Plaxton-bodied AEC Reliance. Actually, I might as well complete the fleet history as apart from the Yelloway coach the only other vehicle I’m aware of a was a Ford Transit. There are other even older ones but they’re so unlikely that it’s not worth listing. I’d be delighted if even one photograph came to light as a result of this appeal. These small coach operators were very poorly recorded and the photographs simply do not exist. I can’t criticise as I didn’t photograph them either! I have good reason to be very grateful to Yelloway – in the 1930’s. I was born in Rochdale in January 1937. My Dad, John Bannon worked at Yelloway as a Clerk and I was told that he used to act as a Conductor. My Mother, Edith Bannon (formerly Brierley) worked at a Grocers and used to visit Yelloway office to obtain small change for the shop. One thing led to another and John and Edith married and I arrived eventually. I have been a lifelong bus enthusiast – unlike my Dad who didn’t know one end of a bus from the other. Hubert Allen was the boss in those far off days. Thank you Yelloway for my ticket to life. It is a joy to read the Yelloway Memories here and on the www.yellowaymotorcoachmuseum web site which Dave Haddock is kindly keeping up to date since I acquired the Coach Museum from him and placed it in the Bury Transport Museum. Please keep them coming in if you have Yelloway memories and visit us at Bury if you can, checking the web site first as it still travels to events. eg Rochdale Town Centre on the 6th and 8th of September. I seem to recall that these Yelloway machines had the 590 engine and ZF 6 speed gearbox – a superb combination. Prior to the ZF being offered, the choice for a 36 footer appeared to be either the 470 engine & 5 speed gearbox (a bit underpowered) or the 590 engine & 4 speed box (a lot under geared). There must have been some technical reason why the 5 speed could not be matched with the 590 engine but does anyone know w hat this reason was? Could the reason the five speed gearbox couldn’t be used with the 590 engine be that the MU series Reliances originally had an affinity with the Mercury range of goods vehicles in respect of engines and gearboxes and this may have carried over to the later variants of the MU Reliance. I have fond memories of travelling to Torquay from Newcastle under Lyme for holidays with my parents and brother in the late fifties. One of the drivers I remember was named Eddie. I did see one of the recent coaches in the Yelloway fleet at Lytham in September 2013. It brought back fond memories. I was a driver for Shearings in the late 70s and early 80s. We had Ford R1114s at that time, nothing older than 5 years old, and I will never forget struggling up the M5 bank towards Frankley Services in our new but grossly underpowered coaches while streams and streams of ancient Yelloway AECs roared past us in the third lane as if we were standing still. But how things changed when Shearings went out and bought a few Leylands with Duple 320 bodies. They would "rev out" on the speed limiter in 5th gear, never mind 6th, and then Yelloways couldn’t catch us. My father was Herbert Holt, brother to Robert Holt the Founders of Yelloway, I remember fondly those days of Yelloway and garage at Drake street Rochdale, where I played and watched the goings on of Yelloway! Those wonderful coaches brought my grandparents for their summer holidays staying with us for a whole fortnight! I thought those buses beautiful as they pulled into Cheltenham having brought them from Oldham. In the early sixties ours would be the only car in the street when we made infrequent trips to Chadderton so Yelloways seemed so important. How we kept looking for them to arrive and seemed so sad at the 1pm departure. Happy days. I don’t know if records would pinpoint the date but there was one famous occasion when the overnight service from Rochdale to Paignton came through Cheltenham with no fewer than 90 coaches on it. Needless to say they were spread over some time but the scheduled time was 01:30. Truly a giant operator of the time.